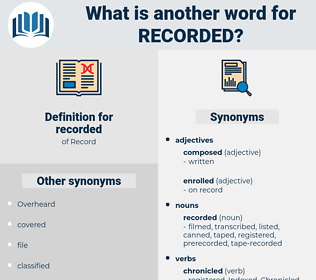 What is another word for recorded? recording, documented, embossed, Inventoried, roll-call, declared, inscribed, registrable, Consigned, marked, Enumerated, unregistered, experienced, Factored, encumbered, deferred, Annotated, documentary. recording, recordings, posts, sets, Strikes, hits, registration, registrations. reproduced, accomplishment, reduced, recognised, produced, Participated, recognized, discovered, acknowledged, Scored, decreased, respectively, disclosed, Responded, addressed, Introduced, represented, detected, covered, labelled, received, demonstrated, characterized, tracked, Delivered, opened, officially, advertised, reflected, Resulted, allocated, Came, broke, directed, Issued, Commented, Reached, Mentioned, Wrote, notice, noticed, Referred, rotated, facilitated, realised, acquired, increase, expressed, Occurred, Encountered, proclaimed, summarized, Investigated, Underwent, footnote, changed, concluded, Raced, Remarked, ended, Cited, checked, nominated, revealed, protocol, Caught, Performed, realized, rule, Undertook, conducted, contained, charged, classified, advised, Captured, Deposited, postponed, suggested, Achieved, Exercised, Endured, Consisted, initiated, Enjoyed, determined, inputted, Searched, retained, Suffered, Generated, monitored, Declined, access, used, affected, Incurred, Tallied, Attracted, outlined, presented, dropped, interviewed, Examined, drew, effected, Returned, Remained, Obtained, Obtaining, established, Establishing, Surveyed, engaged, Explained, emphasized, defined, earned, Appeared, pointed, Exhibited, stressed, Surged, edged, rise, rose, appeal, clocked, Envisaged, Grew, Listened, tied, Carried, Assessed, appropriate, Followed, Stipulated, enlisted, Popped, closed, led, highlighted, tabled, expanded, seized, Submitted, touched, intended, faced, affirmed, Yielded, low, price, Emerged, turned, plummeted, formed, Displayed, spotted, HIT, added, award, Prevailed, Claimed, prize, Awarded, attended, said, posted, Knew, Viewed, struck, signed, Was, Were, Warned, raised, staged, learned, formal, won, call, studied, assumed, Gave, placed, Signaled, Looked, shot, Brought, Accounted, set, saw, totaled, Totalled, found, Went, Counted, Had, released, applied, Gained, figures, Inched, sighted, showed, Picked, Piloted, Flagged, kept, fell, played, felt, Ran, Took, Amounted, Met, Got, made, posts, Inventoried, declared, inscribed, marked, Enumerated, experienced. reproduced, recommended, accomplishment, recovered, reduced, Progressed, reference, referenced, rescheduled, recognised, Regarded, encounteredsome, produced, report, removed, renowned, Participated, condemned, considered, Replicated, Denounced, Rendered, categorized, recognized, revenues, discovered, acknowledged, Compared, rejected, rostered, evidenced, collected, Scored, decreased, labeled, corrected, memorandum, decommitted, restricted, substantiated, concentrated, voiced, disclosed, recalled, Responded, credited, traced, addressed, Collated, conserved, endorsed, overcome, processed, encoded, Compiled, Deplored, Comprised, Accommodated, connected, Introduced, subscribed, Retrieved, converted, represented, confiscated, respected, detected, covered, labelled, recaptured, received, Offered, consolidated, CODED, safeguarded, Revoked, resolved, renewed, Contributed, categorised, Contemplated, restored, demonstrated, enforced, characterized, confirmed, Construed, operations, microfilmed, projected, tracked, Excluded, protected, uncovered, pronounced, Delivered, opened, read, come, guaranteed, articulated, Communicated, Adduced, distinguished, perceived, moved, advertised, reflected, Resulted, allocated, located, Capitalized, continuity, donated, approved, reminded, Predicated, encrypted, Disseminated, underscored, combined, regulated, diagnosed, cancelled, Echoed, advanced, Perpetrated, compliance, Complained, Experimented, evaluated, proved, proven, Computed, Duplicated, foreseen, Attributed, enclosed, directed, Lodged, Remitted, Issued, Originated, Reached, reviewed, writes, Mentioned, Relied, calculated, organised, gathered, Confronted, forfeited, noticed, Referred, Extracted, mainstreamed, positioned, hospitalized, proposed, transposed, rotated, derived, organized, Adhered, constrained, Disengaged, realised, accumulated, remembered, manufactured, acquired, associated, Operated, accrued, expressed, Undergone, Embraced, Occurred, restrained, Encountered, capitalised, authorized, accomplished, entrenched, check, Investigated, footnote, changed, concluded, verified, budgetised, codified, Deployed, required, dedicated, structured, ended, prohibited, Cited, checked, Succeeded, COSTED, Tabulated, updated, designated, nominated, revealed, Drafted, repeated, illustrated, Quoted, Caught, Undertaken, Denoted, income, governed, forged, accused, anticipated, Performed, implemented, realized, Translated, clarified, prescribed, conducted, reversed, Created, contained, charged, classified, enroled, scope, monetized, mandated, estimated, judgement, involved, formulated, upgraded, advised, Captured, budgeted, composed, Grounded, Earmarked, judgment, embodied, Deposited, situated, postponed, regained, Obeyed, arranged, suggested, Achieved, attested, Endured, Consisted, initiated, Enjoyed, Boasted, practised, developed, chosen, copyrighted, Resumed, divided, suspended, determined, strengthened, Searched, retained, merged, Suffered, Generated, obligated, analysed, witnessed, asserted, minuted, valued, Transferred, stored, monitored, Insulated, driven, guided, Ascribed, Declined, decided, Targeted, Disbursed, discharged, welcomed, used, diminished, affected, Handcuffed, Incurred, apportioned, isolated, requested, handled, devoted, transmitted, stop, graded, understood, joined, downloaded, permitted, Attracted, drawn, Abolished, accompanied, extended, outlined, analyzed, presented, dropped, interviewed, instructed, Examined, Enacted, Substituted, Subjected, effected, Returned, emphasised, Obtained, established, Surveyed, engaged, Explained, Deemed, imprinted, quantified, Audited, emphasized, defined, Upheld, subsumed, earned, Appeared, aired, sent, Inserted, freed, pointed, risen, pursued, preserved, Complied, Enunciated, Exhibited, entitled, treated, admitted, stressed, Arisen, Discussed, Argued, Indexed, engraved, embed, embedded, done, grown, exposed, appointed, selected, Gleaned, heard, delayed, accepted, liability, expected, appropriated, attached, poised, assigned, centred, Levelled, Managed, tied, rooted, Carried, Assessed, furnished, Followed, ransacked, Tackled, founded, published, Waived, table, adopted, sustained, executed, closed, led, highlighted, tabled, licensed, woven, itemized, expanded, prepared, seized, Submitted, touched, intended, faced, absorbed, Told, featured, adjusted, Yielded, Emerged, Detained, Instituted, Served, plummeted, impacted, uploaded, thrown, spent, formed, detailed, trained, geared, Borne, tested, Displayed, warranted, assured, Begun, maintained, ranked, loaded, Allowed, spotted, HIT, bound, Anchored, imposed, added, Claimed, started, Awarded, attended, Watched, Been, said, filled, posted, Emitted, inclined, buried, Viewed, granted, burnt, Answered, Classed, Taxed, programmed, signed, Dealt, linked, Warned, posed, raised, called, input, framework, heated, given, Mapped, paid, learned, sampled, stuck, won, limited, studied, grasped, assumed, lifted, fulfilled, placed, imported, Signaled, focused, focussed, justified, seen, fixed, Looked, accounting, have, Has, laid, shot, attained, Brought, Accounted, gone, planned, set, Supplied, filmed, found, Numbered, Happened, controlled, type, typed, Counted, Had, released, applied, designed, Gained, taken, sighted, framed, Passed, fallen, sorted, Flagged, kept, Pushed, aligned, run, played, felt, Visited, built, seated, become, worn, funded, Fitted, based, Met, planted, named, Got, made, Inventoried, declared, inscribed, registrable, Consigned, marked, Enumerated, experienced, encumbered, deferred, Annotated. One more sad event has to be recorded. The fact that the light is normal, and the time to the nearest minute, should be recorded after each observation. ragwort, Richard I, rearguard, Raja Radiata, rag gourd, re-create, rice rat, regard, race riot, ricardo, recreate, racecard, rose-red, reassert, required, resort, Richard Iii, recruit, record, Richard Ii, regret, reassured, rose-root, rough-haired, raw recruit.